WASHINGTON, DC -- July 21, 2017 -- Rural northwest Arkansas resident Mike Frazee provided emotional testimony yesterday before a Senate Committee on Environment and Public Works Subcommittee on Fisheries, Water and Wildlife hearing on what it’s like to live in America with no access to safe drinking water. 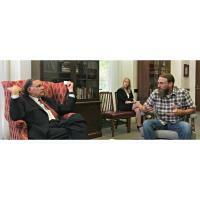 During his introduction of Frazee, Subcommittee Chairman John Boozman (R-AR) noted: “Mr. Frazee has lived in Rogers, Arkansas since 1990. Since moving to Rogers to be closer to his family, he has not had running water. In 2014, Mr. Frazee’s mother contacted my office and we discussed the problem her community was facing. “I live in rural, northwest Arkansas - an area of great natural beauty, but where access to basic services like drinking water can be extremely difficult. Life without drinking water can be strenuous and stressful. You are constantly worried about how much water you have and how much water will be consumed in simple day-to-day activities. In my part of the world, people drive every day, thousands of miles a year, to haul water from a coin operated water machine to their homes. And, if that water machine is broken or you have a snow or ice storm, you might have to go several days without water. “Many people in our area (veterans, disabled, single parents) are down on their luck, just trying to do right and survive. These folks can't go to a bank and ask for loan to pay for a well. We don't have an opportunity to tap into city or rural water systems. Many of our neighbors struggle to have water. We have seen single moms taking their children to haul water in buckets. One also worries about the quality of the water being hauled. The water machine I used has a sign that states - "We cannot insure the quality of the water." How awful is that? “Wells and well systems are a God-send to rural communities like mine. We were never going to have the resources to pay for a drinking water treatment facility or run water lines many miles. However, wells proved to be a very cost effective alternative for me and my neighbors. The Water Systems Council, through its Water Well Trust, has provided my mom, myself and families across Arkansas quality drinking water at a reasonable price through wells." “And last year, Senator Boozman worked with Senator Cardin on legislation requiring the USDA and the EPA to set up a Clearinghouse of information with data on the use of wells and well systems to meet rural drinking water challenges. The Water Systems Council has proven that wells can reduce the cost of providing drinking water to many rural communities by over 75 percent."